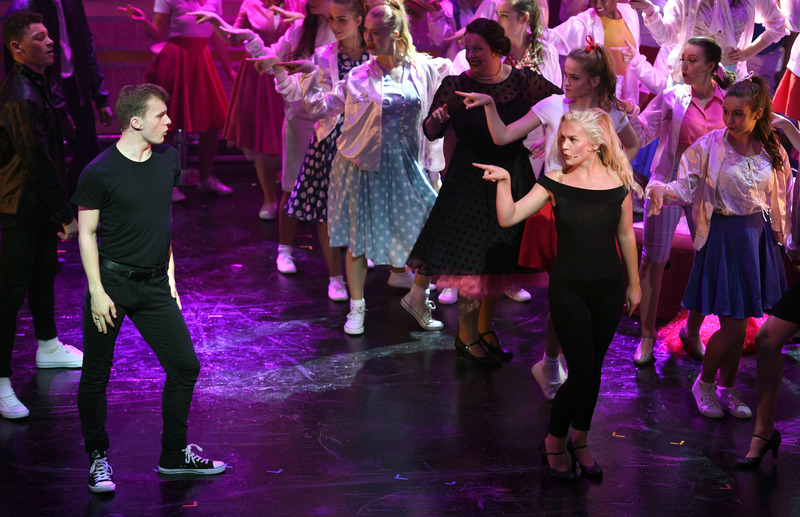 Returning to the New Alexandra Theatre this summer, Stage Experience have outdone themselves on their production of the well-loved high school classic, Grease. The energy is electrifying; from the opening number you are hit with a powerhouse of vocals that never lapses. This is reflected in the duets, as the intricate harmonies are pristine, and the vocal blend between Sandy and Danny is emotively potent. Lighting designer Colin Wood lights the stage beautifully; he creates radiance with the use of contemporary colours during the big ensemble numbers, and elegant shadowing for the more heart-rendering solos. Georgia Anderson’s stellar vocals are triumphant as leading lady Sandy. Capturing the innocence of Sandy’s demeanor, she wins the hearts of the audience, particularly during her emotionally charged performance of Hopelessly Devoted To You, which is thoroughly moving. This is echoed in Sandra Dee Reprise, in which Anderson shines with her phenomenal vocals. Anderson’s chemistry is excellent with Jordan Ricketts, who plays the tough leader of the pack Danny. Despite his careless persona, when Sandy and himself are alone, she manages to really expose his sensitive side, which is displayed in his touching performance of Sandy. It’s always interesting to see an actress master both the virtuous Sandy, and her fierce transformation, but Anderson pulls out all the stops as she oozes sass during the final number You’re The One That I Want. Suspicious of Sandy, Rizzo, the leader of the Pink Ladies played by Sofi Robinson, provides a fiery performance. She masters the hot and cold personality of Rizzo, playing her with a composed exterior which make her hot-tempered moments highly powerful. Robinson has striking wit, and her sarcasm is flawlessly displayed in Sandra Dee. Alongside her, Caven Rimmer displays a strong attitude as the smooth-talking Kenickie. Himself and the T-Birds’ bounce off each other remarkably. Harry Sheasby shines as the hilariously desperate Sonny, his face is excellently animated which portrays his true professionalism as his characterisation never dips. He always seems to find himself in trouble with the stern Mrs Lynch, played sensationally by Izzy Owen who gives a highly convincing performance. Similarly, Charlie Howell’s depiction of Doody is comedic, and his relationship with Frenchy is executed riotously. Georgina Steggles breathes a breath of fresh air on the character of Frenchy, bringing an extraordinary amount of humour to the role. Although we still see her thoughtful side as she takes Sandy under her wing, Steggles is exceptionally funny. Her exuberant characterisation is strong, with vibrant facial expressions that are picked up on even whilst Steggles isn’t at the forefront of the scene. A highlight of the show is Mark Shaun Walsh’s rendition of Beauty School Drop Out. His vocals are outstanding, particularly his impressive falsetto, but Steggles had the audience howling with laughter as she is hit with the epiphany to go back to high school. Similarly, Melissa Husband’s interpretation of Jan has superb comedy timing as member of the Pink Ladies who adores her food. Completing the gang, Jasmine Shen’s performance as Marty is effortlessly natural, and her vocals are beautifully powerful during her solo Freddy My Love. Dynamically choreographed by Pollyann Tanner, despite the large amount of cast on stage, every movement is slick and tight. 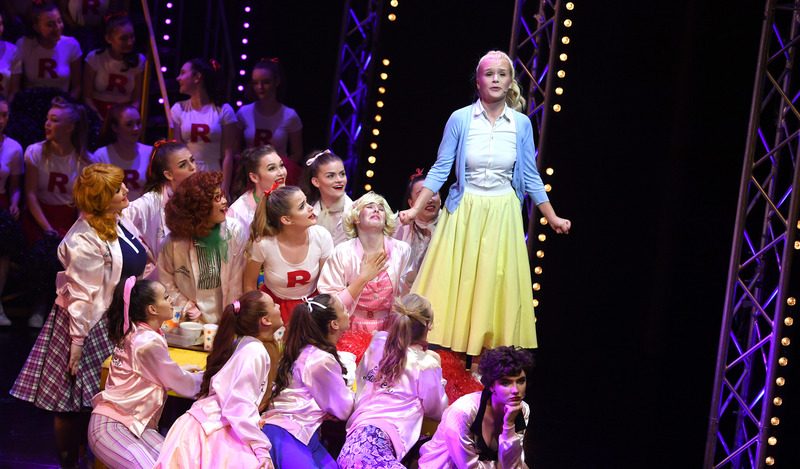 A highlight being Grease Lightening, which boasts the extraordinary dance talent of the young guys in the cast, as they throw themselves into daring tricks that are performed impeccably. Grease is a production bursting with passion and immense vitality. With compelling stand-out performances, it is a true showcase of the stars of the future. On at the New Alexandra Theatre until Saturday the 20th of August, tickets can be found here.